Located in the Osmanabad district of Maharashtra, Tuljapur is a beautiful town and is immensely popular for its age-old temples and other religious sites. 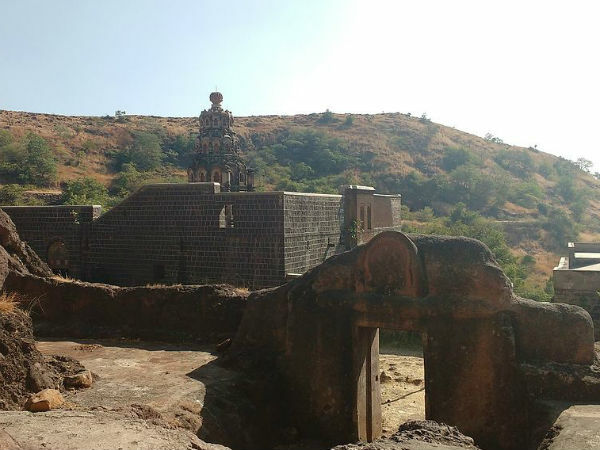 However, being a part of the historical region, the region in and around Tuljapur is home to numerous ancient monuments in the form of caves and forts. So, if you are looking for an offbeat weekend getaway from Hyderabad where you can satisfy the history lover in you, then do consider visiting Tuljapur this season. The raw culture of Maharashtra and its countryside life can be experienced within the boundaries of this small town. Read on to know more about Tuljapur, its tourist attractions and how to reach it. Tuljapur lies in the region which experiences hot summers. Hence, it is mostly visited in between the months of October and March. However, for Hindu devotees and other offbeat travellers, Tuljapur is a year-round destination. By Air: The nearest airport to Tuljapur is situated in Aurangabad at a distance of about 260 km. Once you have reached Aurangabad, you can either take a direct bus or hire a cab to reach Tuljapur. It will take an approximate time of 5 h to reach it from Aurangabad by road. By Rail: Osmanabad railway station is located at a distance of around 30 km from Tuljapur and is well connected to all other cities and towns. You can catch a direct train from Hyderabad to Osmanabad and then from there, a cab or a bus to Tuljapur. By Road: Tuljapur is a popular pilgrimage centre amongst Hindus, and hence it is well connected to all other places by road. It is advisable to take route 1 as it will take an approximate time of 6 h, i.e., 2 h lesser in comparison to the other route, to reach your destination. On your way, you can take a break at Basavakalyan and explore its divine aura present in its spiritual sites. Basavakalyan is located at a distance of about 195 km from Hyderabad and 115 km from Tuljapur and is a perfect place to take a break on account of its peaceful environment. Yes, due to the presence of several beautiful temples and spiritual sites, you can feel the essence of divinity within its boundaries. The city is named after Basavanna, a spiritual leader and a reformer in the 12th century, and therefore you can find the world's tallest statue of Basavanna here. As it also has a history dating back to thousands of years, you can also find numerous ancient monuments within its boundaries. The major places to visit here include Basavakalyana Fort, Anubhava Mantapa and Basavakalyana Temple. Tuljapur is located at a distance of around 300 km from Hyderabad and is immensely popular amongst locals for Tulja Bhavani Temple. It is one of the most popular Bhavani temples in the state and is visited by Hindu devotees in thousands every year. But do you know there is a lot more to explore and savour in Tuljapur? Following is the list of the most significant places one can visit while in and around Tuljapur. The list of tourist attractions in Tuljapur is certainly incomplete without this highly revered temple. It is the site due to which the town has gained popularity across the state and beyond. The temple is dedicated to Goddess Bhavani, and hence it is considered as one of the 51 Shakti Peethas in the country. It was built in the 12th century and has been visited by several great rulers of India in the past, such as Shivaji Maharaj, the most significant ruler of the Maratha Empire. Therefore, it would be right to say that the temple boasts of great historical as well as religious significance. Located on the banks of the Bhima river at a distance of about 115 km from Tuljapur town, Pandharpur is known for Vithoba Temple, which is a significant pilgrimage site and remains flooded with Hindu devotees throughout the year. If you would love to explore beyond the main boundaries of Tuljapur, then you must not miss exploring the beauty of this age-old Vithoba Temple at Pandharpur. It is a complex of 7 ancient caves which are said to have been built in between the 5th and 7th centuries and were used by the Buddhist and the Jain monks. Therefore, they are also considered as sites of spiritual significance. You can find idols of numerous Jain tirthankars within the caves. If you are an archaeology lover and a history enthusiast, then these ancient wonders are your calling. Other places which can be explored in and around Tuljapur include Naldurg Fort, Tuljapur Fort, Ausa Fort, Ghatsheel Mandir and Vishnu Tirth.